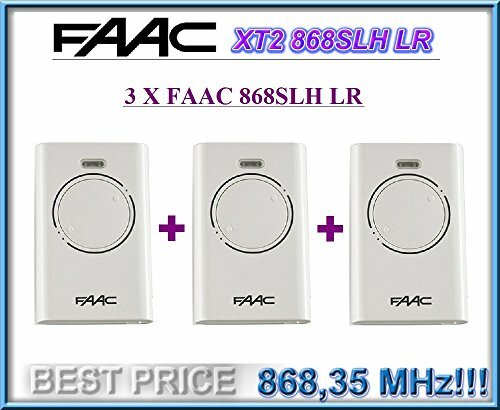 3 X FAAC XT2 868 SLH LR white. Gate remote control keyfob transmitter, 868Mhz rolling code keyfob!!! 3 remotes for a bargain price!!! These are 3 pieces of high quality 868 Mhz rolling code FAAC XT2 868 SLH white remote controls. Comes complete with instructions, 868 Mhz Batteries: 2 x CR2032 3 Volt Lithium (included). Technical details: Type: SLH Frequency: 868.92 MHz ± 100KH Channels: 2 Casing colour: black Power Source: Two lithium batteries, long battery life, 3 V CR2032 Dimensions: 63 x 40 x 10 mm Weight: 40 g Battery: Yes Included in the box contents. If you want to increase the remote control reception range up to 150-200 meters, then you can connect this aerial: https://www.amazon.com/dp/B01MZYAPVN We are fully committed for 100% customer satisfaction. IF YOU HAVE ANY QUESTIONS ABOUT YOUR PURCHASE PLEASE CONTACT US!